Alaska Northwest Books, 9780882408361, 120pp. Eight sled dogs and one woman set out from Barrow, Alaska, to mush 2,500 miles. "ALONE ACROSS THE ARCTIC" chronicles this astounding expedition. 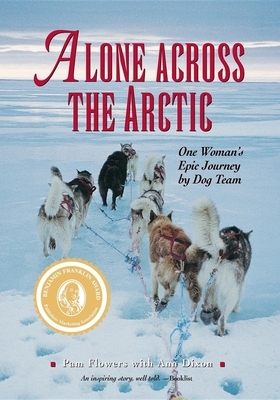 For an entire year, Pam Flowers and her dogs made this epic journey across North America arctic coast. The first woman to make this trip solo, Pam endures and deals with intense blizzards, melting pack ice, and a polar bear. Yet in the midst of such danger, Pam also relishes the time alone with her beloved team. Their survival---her survival---hinges on that mutual trust and love. Forget mystery novels! I couldn't put this book down. ---Patrica McConnell, Ph.D, Host of Calling All Pets, PBS radio, and a certified Applied Animal Behaviorist.